Replacement filters are available at SamsungCanadaParts.com. 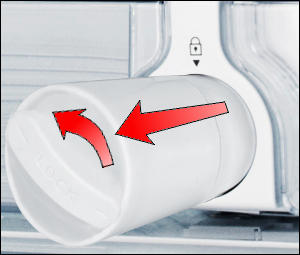 TIP: If you are having trouble getting the filter out of the fridge, turn off water supply valve to the refrigerator and dispense water from the water dispenser until it runs out completely. This will lower the amount of pressure in the filter housing, and allow you to remove the filter easily. Just remember to turn the water supply valve on once the new filter has been installed. 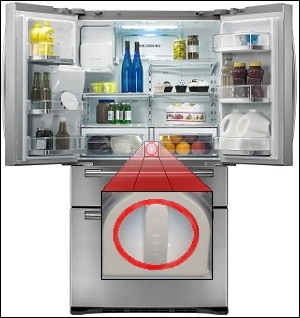 1 Locate the Water Filter Housing between the crisper drawers. 2 Turn the water filter counterclockwise. 3 Pull outward on the water filter as you are rotating it counterclockwise. 4 Remove the old filter completely, insert the new filter into the filter housing, and follow the steps above in reverse to complete the installation. NOTE: Apply slow, steady pressure when you turn the filter. Turning the water filter may be difficult, but ensures a tight seal. 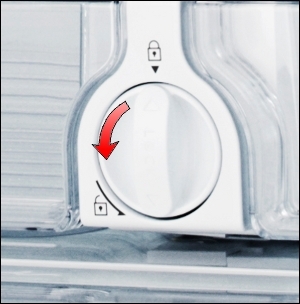 Additionally, remember to turn on the water supply valve if you turned it off before installing the new filter. Important: Because this FAQ is general, we can’t be specific about the part number of the specific filter you need for your specific fridge. That said, there is an easy way to know what filter you should use for your specific fridge by checking the reference on your old filter. Remove the old filter, check the number and put it back, until you get the new one. This is actually the best strategy to avoid any mistake. You can buy a replacement filter from our authorized parts distributor online. Please visit the following website: https://www.samsungcanadaparts.com.